In the world of creative music, rehearsal time is frequently a scarce commodity. For many bands, the task of learning new music before recording it can often be a challenge and a logistical nightmare. So in the summer of 2015, when guitarist Mary Halvorson, bassist Michael Formanek and percussionist Tomas Fujiwara, calling their trio “Thumbscrew,” were offered a two week residency in Pittsburgh, giving them time to collaborate on new material, they couldn’t get to the Iron City fast enough. The music created in Pittsburgh would become the next Thumbscrew CD, recently released by Cuneiform Records. It is called Convallaria, which is a flowering plant, often referred to as the Lily of the Valley, and known to be sweetly scented and highly poisonous … an apt description of the eleven pieces on this CD, which are beautifully composed, highly melodic, but with free improvisation by three masters of their craft, that is infectious, if not contagious. From the start of the album, it’s evident that Thumbscrew is truly a collective trio. While Halvorson, Formanek and Fujiwara are all experienced bandleaders, on Convallaria, each of them have contributed compositions. They clearly intended to create vehicles to showcase the group as a whole, as opposed to the individual and accomplished talents of the composer. It is probably not a coincidence that Formanek’s composition, “Sampsonian Rhythms,” opens with a brief solo by Fujiwara, or that one of the highlights of “Danse Insensé,” also written by Formanek, is an extended and very musical percussion solo by Fujiwara. Similarly, Fujiwara’s “Barn Fire Slum Brew” opens with Halvorson stating the melody on her guitar, before going into a solo with the backing of her two partners. Eventually, Halvorson lays out and hands the baton to Formanek, whose solo morphs into a walking bass line that invites the others back in to re-state the melody, and close out the seven minute piece. 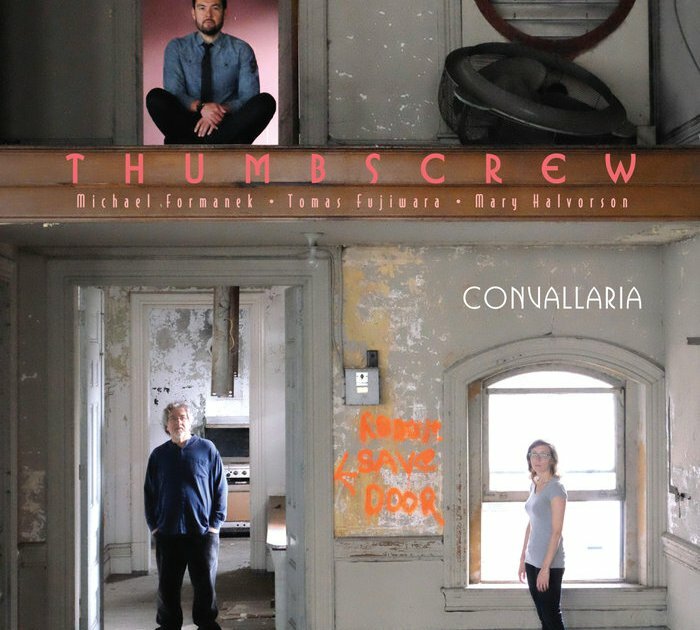 Go out to a record store, or get online and get a copy of Thumbscrew’s Convallaria. Listen to it, and as with a bottle of fine wine, let it breathe and develop. This is 70 plus minutes of thoughtful, often intense, and dramatic music, that matures and offers something new with every listen.